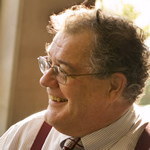 Professor Moriarty teaches primarily in the area of criminal law. Before coming to the Albany Law School in 1971 he was an Assistant District Attorney in Albany County, New York for a year and was a law clerk in New York's intermediate appellate court (Appellate Division, 3rd Department, Albany, NY) specializing in criminal appeals. Over the years he has taught a number of criminal law courses including Comparative Criminal Law, Sentencing and Punishment, Juvenile Justice, and White Collar Crimes. Professor Moriarty received a B.S.F.S. (Bachelor of Science, Foreign Service) in 1964 from the Georgetown University's School of Foreign Service, and a J.D. in 1967 from Georgetown's Law Center.